This yo-yo was conceived by Kyle Weems. It takes it's inspiration from Stan Zygo's aluminum wheel and then takes it another step further. This is an aluminum ballbearing, transaxle yo-yo that uses Duncan inner working parts and friction stickers; it is built using the dimensions of an aluminum ballbearing Duncan Wheel yo-yo. 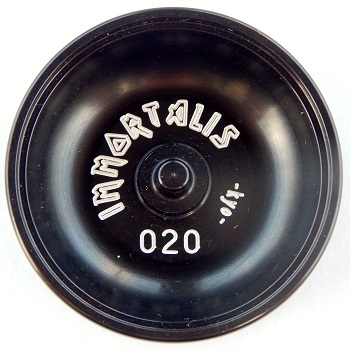 The yo's name is short for "immortalis rota"--latin for immortal wheel. These "wheels" were made in red, black, and blue. Number choice was only available if you wanted a matching set; that is, one of each color, each with the same number on them. (The model in this exhibit has a "radar" serial number.) They came with a pair of original Duncan wheel yo-yo caps. The caps came in grey, white, and red and were slightly loose fitting by design. As such, they required shimming with cellophane tape to hold them in place on the yo-yo.